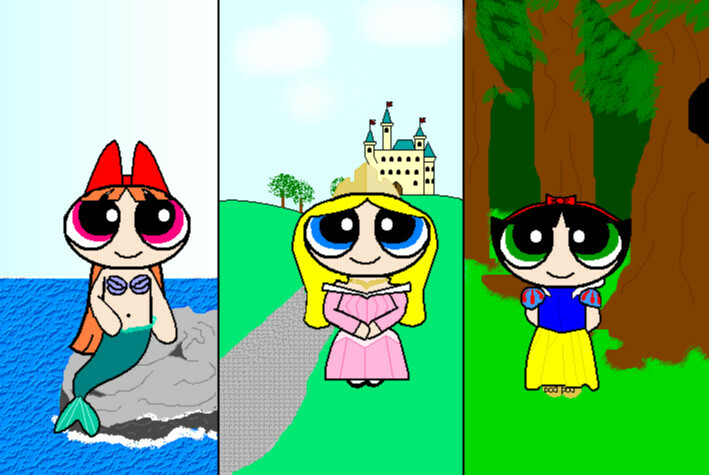 As you can see, this crossover represents Blossom as Ariel from the Little Mermaid, Bubbles as Aurora from the Sleeping beauty, and Buttercup as Snow White from Snow White and the Seven Dwarfs. Thanks! You know, it makes me fun that because of the Hungarian translation, Aurora has a totally different name (Csipkerózsika), even it comes from the tale itself, not the movie. Congrats on getting on the front page! This is a neat idea! I was trying to think what Disney princess Blossom could fit in (since there are not many princesses with red hair), but then I saw you put her up as Ariel! Nice work! Thanks! Well, it was in the request to draw her as Ariel, but eventually it was a clear idea, because there's no other Disney princess with red hair (or at least I don't know anyone else). That is very cute! Good work. I like the textures in the backgrounds you made. That's pretty nice. Thanks alot! I especially made experiments on the effect of the water, so I'm glad you like the background as well.